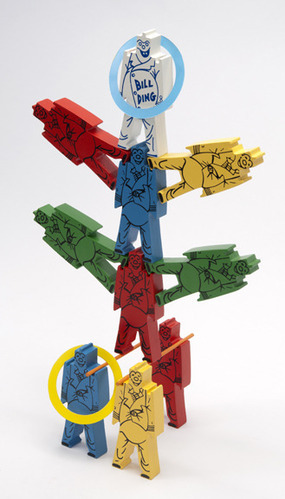 With more than 1001 configurations, you can have endless fun with the classic Bill Ding Balancing Clowns. A toy that has stood the test of time, Bill Ding originated in the late 1930's and continues to be a favorite for those who remember. They can be stacked head to head, shoulder to foot and many other ways. The trick is to balance all on one central clown. Bill Ding Balancing Clowns are considered one of the best eye/hand coordination toys ever made. The Deluxe Set includes 15 clowns, 2 dowels, 6 toss rings, and an instruction booklet.